Golden Bay is about 1 Km from Manikata. 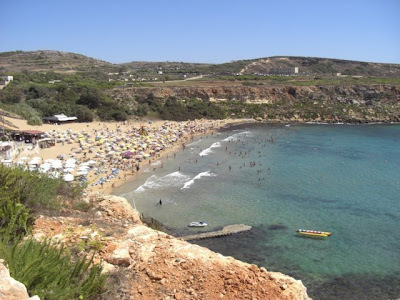 Golden Bay is probably the most sandy beach in Malta. The bay was called Military Bay before it became known as Golden Bay. The golden colour of the sand gives the name to the bay. When the sun is hot the sand becomes unbearably hot so be prepared. Golden Bay - Malta 26th October 2017. As you can see the weather can be warm enough to go for a swim in Malta in October and November. This video was taken late October. This is a favourite seaside resort both for local and visiting folk. The Radisson Hotel towers over the bay, prior to this we had Golden Bay Hotel and Cote D'or hotels. The hotels are very popular all year round.